The prevalence and use of 3D CGI in Japan is perhaps one of the biggest ongoing debates you'll find in the anime fandom. Despite the medium coming a long, long way in recent years and resulting in both notable films and shows, you'll always find that sect of fans that argue that it doesn't hold a candle to traditional 2D animation. However if there's one show that can hopefully change this, it's Land of the Lustrous (Hōseki no Kuni). 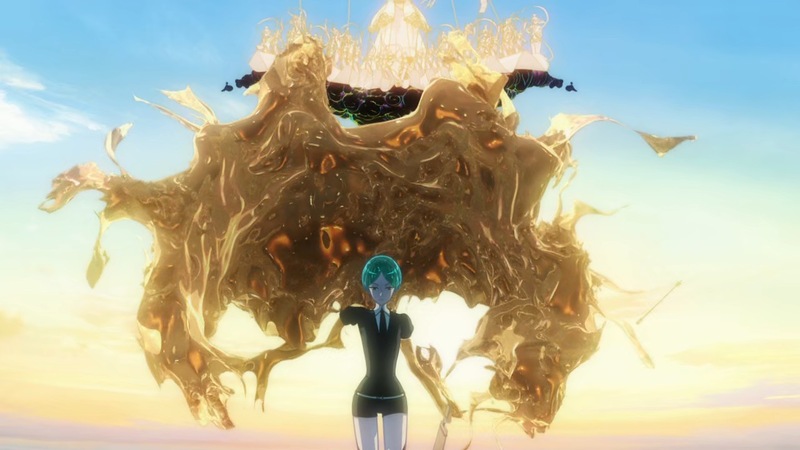 Based on the manga series by Haruko Ichikawa and animated by CGI specialist studio Orange as their first lead project (though their vast repertoire includes the likes of Accel World, Macross Frontier, Ghost in the Shell: Arise, KanColle and more), Land of the Lustrous was one of the hottest shows of the 2017 fall anime season - and with very good reason. In a far off future where humanity has seemingly ceased to exist, a lone island is inhabited by sentient lifeforms that have evolved from gemstones along with their wise master. Though the gems have developed an idyllic society where each one of them has a place, they are under constant threat from the Lunarians - creatures from the moon that come down to Earth to capture the gems and turn them in jewellery. Though the gems can be repaired if shattered, their memories are stored within the pieces - if a single one is missing, then effectively so is a part of them. At a mere 300 years old, Phosphophyllite (aka Phos) is not only one of the youngest but also one of the weakest gems - lacking a true purpose and often looked down upon by their peers. 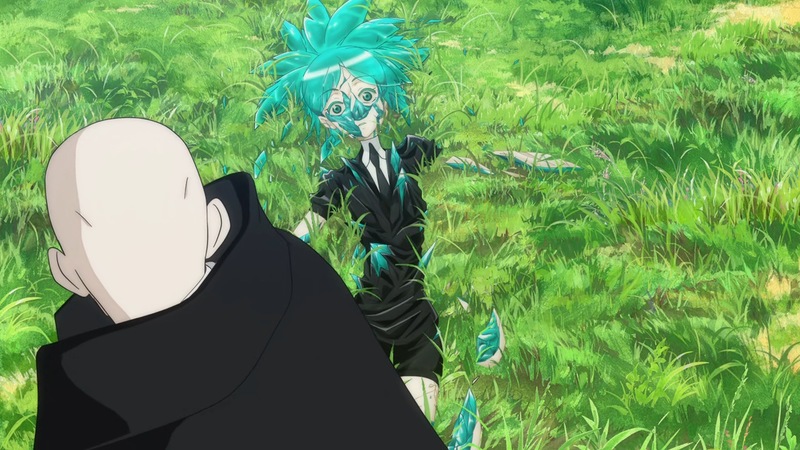 But after an encounter with Cinnabar, another gem rejected because of their poisonous ability, Phos sets out on a journey that will help them both find a more fulfilling life. 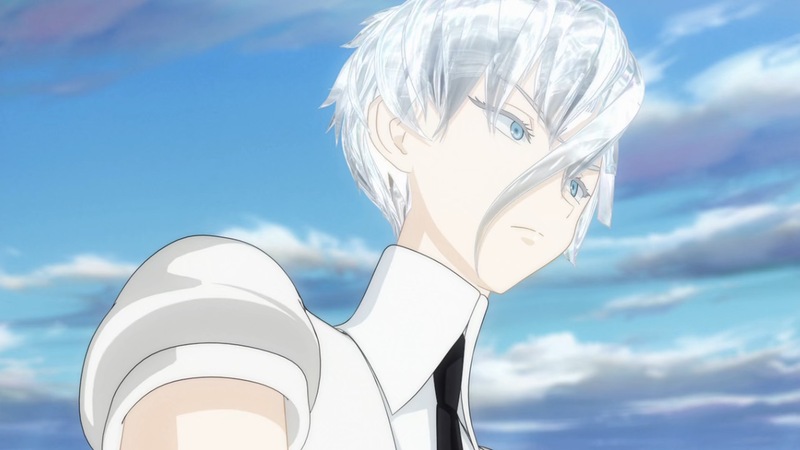 As a 3D CGI series, the determining factor for many as to whether to give Land of the Lustrous a fair shot will be its visual quality. Though as a studio Orange have been around for a good while and contributed to some pretty popular shows, it would be fair to say that their visuals don't always gel well with the 2D characters or background they have to work with. That isn't meant as a slight on them as a studio at all, but more an unfortunate truth for many of the works detractors will cite in the seemingly never ending debate. However when Orange are given their own playground to work with, it's a very different story. The kaleidoscopic visuals of the show's opening should be more than enough to convince you of just how stunning Land of the Lustrous looks. 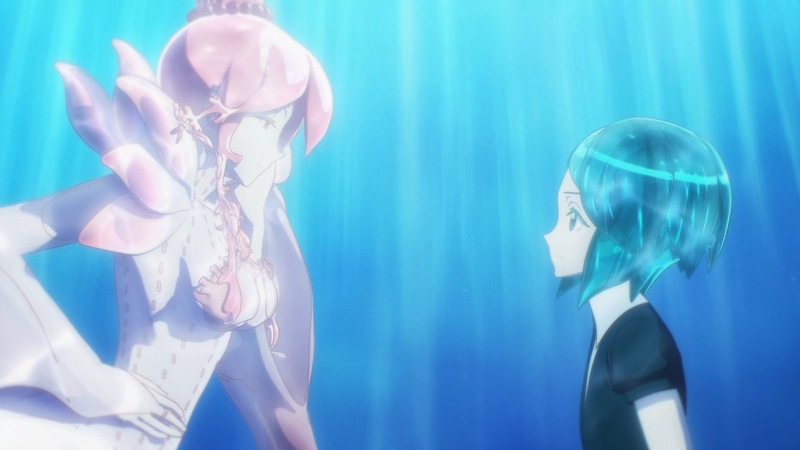 Whereas many shows aim for realism and ultimately fall short, Land of the Lustrous hits a perfect sweet spot in matching the manga's distinct art style and character design. The animation is both vibrant and fluid, with the fight sequences exhilarating and well choreographed. 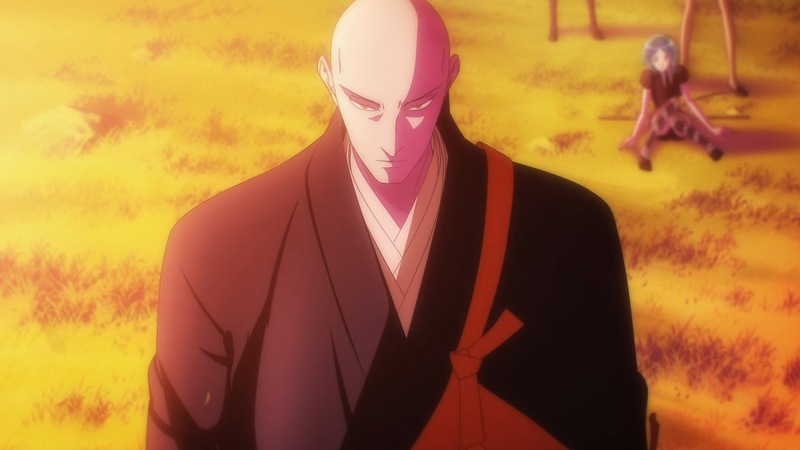 The show's use of its soundtrack is equally masterful, flicking between the peaceful tranquility of the gems's remote island and the haunting chills of a Lunarian attack at a moment's notice. But even outside of the visuals there is just so much attention to detail here that you can't help but to be impressed. 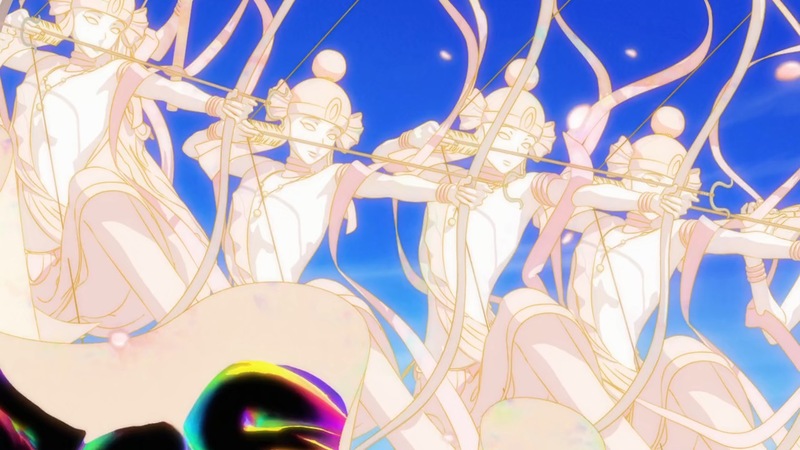 From the gems varying shimmer and hardness (recorded via the Mohs scale of mineral hardness) to the nightmarish Buddhist imagery of the oncoming Lunarians, Land of the Lustrous is a rich tapestry of imagery and symbolism. Though the narrative doesn't dwell on it the show pushes the boundaries with its use of gender neutral pronouns to identify the characters - a subject which in addition to offering inclusiveness has created more interest and discussion in the series. Though amongst all this rich imagery, Land of the Lustrous is the journey of a single character. Phos' growth from a weak, often bratty child into a wise and disciplined gem is the very foundation of the story, and is handled brilliantly and without lack of consequence. As if the grim body horror of watching gems shatter and rebuild wasn't twisted enough, a much bigger sacrifice is the idea that even a single slither can hold the most precious memories. As one of the weakest gems Phos is subject to several instances of breakage, in time augmenting their own body to adapt. This however potentially comes at the price of sacrificing just who Phos is, and this is something we witness as Phos becomes more competent over time. It's an interesting play on the standard "coming of age" story, and positions Phos in a particularly interesting way in that you focus on what they lose as well as how they grow. 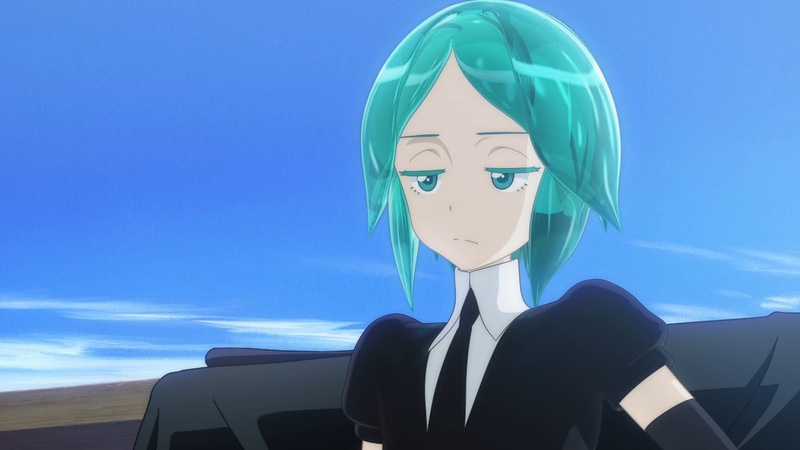 That's not to say that Phos is the only character that matters though, with many of the other gems also playing a big part in helping this rather deserted world feeling just so crowded. 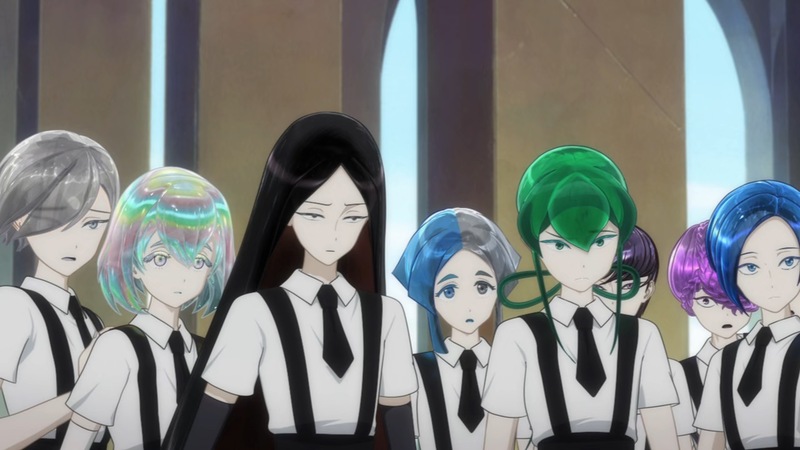 Though often under-utilised many of the supporting cast prove just as memorable as Phos themselves, each with their own unique designation or abilities. Rutile is a medic gem with an unhealthy obsession with dissection, while Bort is the society's disciplined fighter. Meanwhile Alexandrite is a gem obsessed with uncovering the secrets of the Lunarians, but hilariously cursed with the tendency to fly into an uncontrollable rage whenever their face to face with one. On the more interesting side are the aforementioned Cinnabar, as well as the unforgettable Antarcitite - a gem who only becomes solid during the harsh winters. Those that are crucial to Phos' story naturally have more screen time devoted to them, but it's fair to say that they all feel like they have their own stories to tell as well. However this is a lead in to what's undoubtedly the show's biggest weakness, enforced all the more by the things it does so well - the fact that Land of the Lustrous will want you leaving so much more. Of course such a thing could be said about any series worth its salt, but the problem here is these 12 episodes barely scratch the surface of the questions they pose - and at the time of writing there's still no indication as to whether a second season is on the cards. With this season being primarily about Phos' growth its somewhat understandable that some of these questions take a backseat, but it's that world building that makes Land of the Lustrous just so mesmerising in the first place. 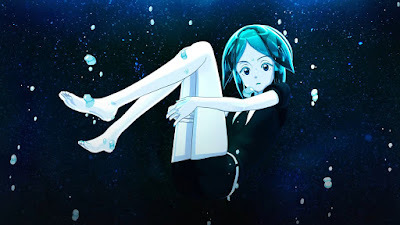 Whether it be the history of this barely inhabited world, the origins of both the gems and the Lunarians or the even bigger questions the final few episodes pose, Land of the Lustrous is just crying out for another season. For those who simply can't wait there'll always be the manga available to dive head first into, but it would be a shame to not see the story continue without those spellbinding visuals. Despite this review running for well over 1000 words, Land of the Lustrous is a surprisingly difficult show to put into words. It really does have to be seen to be truly appreciated, dazzling the senses with its colourful visuals, tugging at the heart with its cast and probing the mind with its lingering mysteries. It's only significant shortcoming is that it feels like a small piece of a much bigger puzzle, devoid of any real backstory and prompting questions that this particular set of episodes never really had any intention of answering. 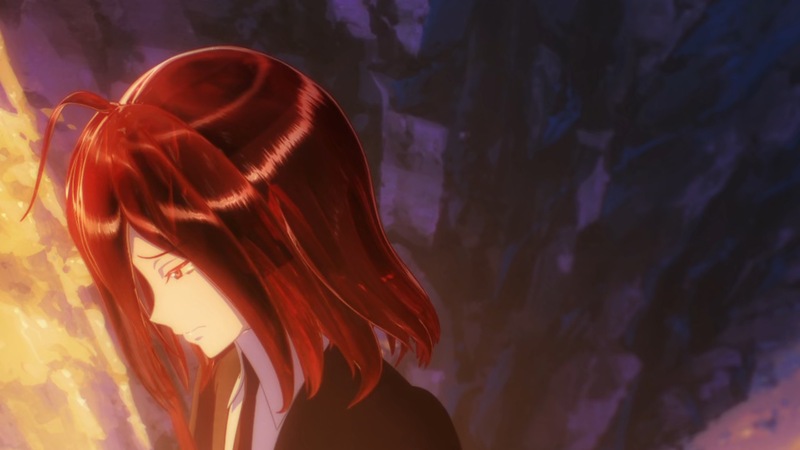 All can be forgiven if a season two is just around the corner, but with so many other great shows having come and gone in a similar fashion one can only hope Land of the Lustrous has what it takes to shine brighter than the others.